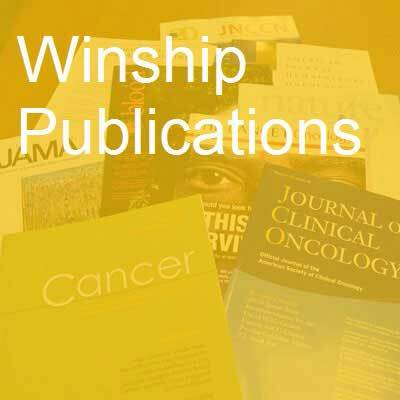 Various first authors and senior authors from Winship Cancer Institute have published 82 studies in major medical and scientific journals in the past month. Gender Similarities and Differences for e-Health Behaviors Among U.S. Adults. Escoffery C. Telemedicine journal and e-health : the official journal of the American Telemedicine Association. 2018; 24(5):335-343. PubMed PMID: 28813630. Glyphosate Use and Cancer Incidence in the Agricultural Health Study: An Epidemiologic Perspective. Ward EM. Journal of the National Cancer Institute. 2018; 110(5):446-447. PubMed PMID: 29155945. Efficacy and Safety of Ramucirumab With Docetaxel Versus Placebo With Docetaxel as Second-Line Treatment of Advanced Non-Small-Cell Lung Cancer: A Subgroup Analysis According to Patient Age in the REVEL Trial. Ramalingam SS, Pérol M, Reck M, Kowalyszyn RD, Gautschi O, Kimmich M, Cho EK, Czyzewicz G, Grigorescu A, Karaseva N, Dakhil S, Lee P, Zimmerman A, Sashegyi A, Alexandris E, Carter GC, Winfree KB, Garon EB. Clinical lung cancer. 2018; 19(3):270-279.e3. PubMed PMID: 29373274. Commentary on: Enhanced Recovery After Surgery: The Plastic Surgery Paradigm Shift. Sullivan PS. Aesthetic surgery journal. 2018; 38(6):686-688. PubMed PMID: 29394322. Update on F-Fluciclovine PET for Prostate Cancer Imaging. Parent EE, Schuster DM. Journal of nuclear medicine : official publication, Society of Nuclear Medicine. 2018; 59(5):733-739. PubMed PMID: 29523631. Physiological Regulation of Drug Metabolism and Transport: Pregnancy, Microbiome, Inflammation, Infection, and Fasting. Morgan ET, Dempsey JL, Mimche SM, Lamb TJ, Kulkarni S, Cui JY, Jeong H, Slitt AL. Drug metabolism and disposition: the biological fate of chemicals. 2018; 46(5):503-513. PubMed PMID: 29514828; PubMed Central PMCID: PMC5885931. A patient-centered team approach in oncology. Wu CS, El-Rayes BF. Cancer. 2018; 124(9):1856-1858. PubMed PMID: 29633252. Radiation Oncology Review Series. Shu HG. Neurosurgery. 2018; 82(5):592-594. PubMed PMID: 29669115. Introducing a curriculum in ethics and professionalism for dermatology residencies. Stoff BK, Grant-Kels JM, Brodell RT, Paller AS, Perlis CS, Mostow E, Pariser D, Bercovitch L. Journal of the American Academy of Dermatology. 2018; 78(5):1032-1034. PubMed PMID: 29678377. C/EBPβ regulates delta-secretase expression and mediates pathogenesis in mouse models of Alzheimer's disease. Wang ZH, Gong K, Liu X, Zhang Z, Sun X, Wei ZZ, Yu SP, Manfredsson FP, Sandoval IM, Johnson PF, Jia J, Wang JZ, Ye K. Nature communications. 2018; 9(1):1784. PubMed PMID: 29725016. Validation of Version 3.0 of the Breast Cancer Genetics Referral Screening Tool (B-RST™). Bellcross C, Hermstad A, Tallo C, Stanislaw C. Genetics in medicine : official journal of the American College of Medical Genetics. 2018; PubMed PMID: 29740170. Associations among human papillomavirus, inflammation, and fatigue in patients with head and neck cancer. Xiao C, Beitler JJ, Higgins KA, Glazer T, Huynh LK, Paul S, Felger JC, Wommack EC, Saba NF, Shin DM, Bruner DW, Miller AH. Cancer. 2018; PubMed PMID: 29742284. Perceived importance of substance use prevention in juvenile justice: a multi-level analysis. Sales JM, Wasserman G, Elkington KS, Lehman W, Gardner S, McReynolds L, Wiley T, Knudsen H. Health & justice. 2018; 6(1):12. PubMed PMID: 29766374. Academic Drug Development: The DRIVE Model. Liotta D, Painter G. ACS medicinal chemistry letters. 2018; 9(5):403-407. PubMed PMID: 29795749; PubMed Central PMCID: PMC5949841. Cigarette use trajectories in young adults: Analyses of predictors across system levels. Berg CJ, Haardörfer R, Milkie V, Getachew B, Lloyd SA, Lanier A, Childs D, Sandridge Y, Bierhoff J, Li J, Dossantos E, Windle M. Drug and alcohol dependence. 2018; 188:281-287. PubMed PMID: 29807215. How I treat older patients with acute myeloid leukemia. Arellano M, Carlisle JW. Cancer. 2018; PubMed PMID: 29809277. A 'Framingham-like' Algorithm for Predicting 4-Year Risk of Progression to Amnestic Mild Cognitive Impairment or Alzheimer's Disease Using Multidomain Information. Steenland K, Zhao L, John SE, Goldstein FC, Levey A, Alvaro A, . Journal of Alzheimer's disease : JAD. 2018; PubMed PMID: 29843232. Selenium unmasks protective iron armor: A possible defense against cutaneous inflammation and cancer. Arbiser JL, Bonner MY, Ward N, Elsey J, Rao S. Biochimica et biophysica acta. 2018; PubMed PMID: 29852199. Transplantation Versus Resection for Hilar Cholangiocarcinoma: An Argument for Shifting Treatment Paradigms for Resectable Disease. Ethun CG, Lopez-Aguiar AG, Anderson DJ, Adams AB, Fields RC, Doyle MB, Chapman WC, Krasnick BA, Weber SM, Mezrich JD, Salem A, Pawlik TM, Poultsides G, Tran TB, Idrees K, Isom CA, Martin RCG, Scoggins CR, Shen P, Mogal HD, Schmidt C, Beal E, Hatzaras I, Shenoy R, Cardona K, Maithel SK. Annals of surgery. 2018; 267(5):797-805. PubMed PMID: 29064885; PubMed Central PMCID: PMC6002861. Lymph node metastasis in early gastric adenocarcinoma in the United States of America. Pokala SK, Zhang C, Chen Z, Gamboa AM, Cristofaro SL, Keilin SA, Cai Q, Willingham FF. Endoscopy. 2018; 50(5):479-486. PubMed PMID: 29228402. Effective management strategies for patients with marginal zone lymphoma. Rosand CB, Valla K, Flowers CR, Koff JL. Future oncology (London, England). 2018; 14(12):1213-1222. PubMed PMID: 29260925; PubMed Central PMCID: PMC5992567. Peritransplantation Red Blood Cell Transfusion Is Associated with Increased Risk of Graft-versus-Host Disease after Allogeneic Hematopoietic Stem Cell Transplantation. Hosoba S, Waller EK, Shenvi N, Graiser M, Easley KA, Al-Kadhimi Z, Andoh A, Antun AG, Barclay S, Josephson CD, Koff JL, Khoury HJ, Langston AA, Zimring JC, Roback JD, Giver CR. Biology of blood and marrow transplantation : journal of the American Society for Blood and Marrow Transplantation. 2018; 24(5):973-982. PubMed PMID: 29307717; PubMed Central PMCID: PMC5953791. Strategies to target the Hedgehog signaling pathway for cancer therapy. Xin M, Ji X, De La Cruz LK, Thareja S, Wang B. Medicinal research reviews. 2018; 38(3):870-913. PubMed PMID: 29315702. Associations of mitochondrial polymorphisms with sporadic colorectal adenoma. Thyagarajan B, Guan W, Fedirko V, Barcelo H, Ramasubramaian R, Gross M, Goodman M, Bostick RM. Molecular carcinogenesis. 2018; 57(5):598-605. PubMed PMID: 29323753; PubMed Central PMCID: PMC5880705. Patterns of Internet-based health information seeking in adult survivors of childhood cancer. Claridy MD, Hudson MM, Caplan L, Mitby PA, Leisenring W, Smith SA, Robison LL, Mertens AC. Pediatric blood & cancer. 2018; 65(5):e26954. PubMed PMID: 29350454; PubMed Central PMCID: PMC5867215. Phase 1b study of pasireotide, everolimus, and selective internal radioembolization therapy for unresectable neuroendocrine tumors with hepatic metastases. Kim HS, Shaib WL, Zhang C, Nagaraju GP, Wu C, Alese OB, Chen Z, Brutcher E, Renfroe M, El-Rayes BF. Cancer. 2018; 124(9):1992-2000. PubMed PMID: 29451701. Outpatient Management of Fever and Neutropenia in Adults Treated for Malignancy: American Society of Clinical Oncology and Infectious Diseases Society of America Clinical Practice Guideline Update. Taplitz RA, Kennedy EB, Bow EJ, Crews J, Gleason C, Hawley DK, Langston AA, Nastoupil LJ, Rajotte M, Rolston K, Strasfeld L, Flowers CR. Journal of clinical oncology : official journal of the American Society of Clinical Oncology. 2018; 36(14):1443-1453. PubMed PMID: 29461916. Validation of a Customized Bioinformatics Pipeline for a Clinical Next-Generation Sequencing Test Targeting Solid Tumor-Associated Variants. Schneider T, Smith GH, Rossi MR, Hill CE, Zhang L. The Journal of molecular diagnostics : JMD. 2018; 20(3):355-365. PubMed PMID: 29471113. Overexpression of the base excision repair NTHL1 glycosylase causes genomic instability and early cellular hallmarks of cancer. Limpose KL, Trego KS, Li Z, Leung SW, Sarker AH, Shah JA, Ramalingam SS, Werner EM, Dynan WS, Cooper PK, Corbett AH, Doetsch PW. Nucleic acids research. 2018; 46(9):4515-4532. PubMed PMID: 29522130; PubMed Central PMCID: PMC5961185. Prenatal exposure to maternal depression and anxiety on imprinted gene expression in placenta and infant neurodevelopment and growth. Litzky JF, Deyssenroth MA, Everson TM, Lester BM, Lambertini L, Chen J, Marsit CJ. Pediatric research. 2018; 83(5):1075-1083. PubMed PMID: 29538358; PubMed Central PMCID: PMC5959758. Physician Reimbursement for Prostate Biopsies Falls as Procedures Shift From Offices to Facilities. Henry MA, Howard DH, Davies BJ, Filson CP. Urology. 2018; 115:96-101. PubMed PMID: 29545049. Potential of Aqueous Humor as a Surrogate Tumor Biopsy for Retinoblastoma. Uner OE, Ulrich BC, Hubbard GB. JAMA ophthalmology. 2018; 136(5):597-598. PubMed PMID: 29566119. A Huntingtin Knockin Pig Model Recapitulates Features of Selective Neurodegeneration in Huntington's Disease. Yan S, Tu Z, Liu Z, Fan N, Yang S, Yang W, Zhao Y, Ouyang Z, Lai C, Yang H, Li L, Liu Q, Shi H, Xu G, Zhao H, Wei H, Pei Z, Li S, Lai L, Li XJ. Cell. 2018; 173(4):989-1002.e13. PubMed PMID: 29606351; PubMed Central PMCID: PMC5935586. Tropomyosin isoforms differentially affect muscle contractility in the head and body regions of the nematode Caenorhabditis elegans. Barnes DE, Watabe E, Ono K, Kwak E, Kuroyanagi H, Ono S. Molecular biology of the cell. 2018; 29(9):1075-1088. PubMed PMID: 29496965; PubMed Central PMCID: PMC5921574. Bevacizumab and near infrared probe conjugated iron oxide nanoparticles for vascular endothelial growth factor targeted MR and optical imaging. Lin R, Huang J, Wang L, Li Y, Lipowska M, Wu H, Yang J, Mao H. Biomaterials science. 2018; 6(6):1517-1525. PubMed PMID: 29652061. Role of PD-1 during effector CD8 T cell differentiation. Ahn E, Araki K, Hashimoto M, Li W, Riley JL, Cheung J, Sharpe AH, Freeman GJ, Irving BA, Ahmed R. Proceedings of the National Academy of Sciences of the United States of America. 2018; 115(18):4749-4754. PubMed PMID: 29654146; PubMed Central PMCID: PMC5939075. Mental Health of Transgender and Gender Nonconforming Youth Compared With Their Peers. Becerra-Culqui TA, Liu Y, Nash R, Cromwell L, Flanders WD, Getahun D, Giammattei SV, Hunkeler EM, Lash TL, Millman A, Quinn VP, Robinson B, Roblin D, Sandberg DE, Silverberg MJ, Tangpricha V, Goodman M. Pediatrics. 2018; 141(5). PubMed PMID: 29661941; PubMed Central PMCID: PMC5914494. Prospective evaluation of fluciclovine ( F) PET-CT and MRI in detection of recurrent prostate cancer in non-prostatectomy patients. Akin-Akintayo O, Tade F, Mittal P, Moreno C, Nieh PT, Rossi P, Patil D, Halkar R, Fei B, Master V, Jani AB, Kitajima H, Osunkoya AO, Ormenisan-Gherasim C, Goodman MM, Schuster DM. European journal of radiology. 2018; 102:1-8. PubMed PMID: 29685521; PubMed Central PMCID: PMC5918427. TASI: A software tool for spatial-temporal quantification of tumor spheroid dynamics. Hou Y, Konen J, Brat DJ, Marcus AI, Cooper LAD. Scientific reports. 2018; 8(1):7248. PubMed PMID: 29739990; PubMed Central PMCID: PMC5940855. Release the autophage brake on inflammation: The MAPK14/p38α-ULK1 pedal. She H, He Y, Zhao Y, Mao Z. Autophagy. 2018; :1-2. PubMed PMID: 29749797. Is a 500-Cell Count Necessary for Bone Marrow Differentials? : A Proposed Analytical Method for Validating a Lower Cutoff. Abdulrahman AA, Patel KH, Yang T, Koch DD, Sivers SM, Smith GH, Jaye DL. American journal of clinical pathology. 2018; PubMed PMID: 29757362. Influence of margin histology on development of pancreatic fistula following pancreatoduodenectomy. Harrell KN, Jajja MR, Postlewait LM, Memis B, Maithel SK, Sarmiento JM, Adsay NV, Kooby DA. The Journal of surgical research. 2018; PubMed PMID: 29754962. Strategies toward Organic Carbon Monoxide Prodrugs. Ji X, Wang B. Accounts of chemical research. 2018; PubMed PMID: 29762011. Optimized distributed systems achieve significant performance improvement on sorted merging of massive VCF files. Sun X, Gao J, Jin P, Eng C, Burchard EG, Beaty TH, Ruczinski I, Mathias RA, Barnes KC, Wang F, Qin Z, . GigaScience. 2018; PubMed PMID: 29762754. Corticoinsular circuits encode subjective value expectation and violation for effortful goal-directed behavior. Arulpragasam AR, Cooper JA, Nuutinen MR, Treadway MT. Proceedings of the National Academy of Sciences of the United States of America. 2018; PubMed PMID: 29760060. Association of perioperative transfusion with survival and recurrence after resection of gallbladder cancer: A 10-institution study from the US Extrahepatic Biliary Malignancy Consortium. Lopez-Aguiar AG, Ethun CG, McInnis MR, Pawlik TM, Poultsides G, Tran T, Idrees K, Isom CA, Fields RC, Krasnick BA, Weber SM, Salem A, Martin RCG, Scoggins CR, Shen P, Mogal HD, Schmidt C, Beal EW, Hatzaras I, Shenoy R, Cardona K, Maithel SK. Journal of surgical oncology. 2018; PubMed PMID: 29761515. Enrichment-triggered prodrug activation demonstrated through mitochondria-targeted delivery of doxorubicin and carbon monoxide. Zheng Y, Ji X, Yu B, Ji K, Gallo D, Csizmadia E, Zhu M, Choudhury MR, De La Cruz LKC, Chittavong V, Pan Z, Yuan Z, Otterbein LE, Wang B. Nature chemistry. 2018; PubMed PMID: 29760413. B cell activation and plasma cell differentiation are inhibited by de novo DNA methylation. Barwick BG, Scharer CD, Martinez RJ, Price MJ, Wein AN, Haines RR, Bally APR, Kohlmeier JE, Boss JM. Nature communications. 2018; 9(1):1900. PubMed PMID: 29765016. Untargeted Metabolomics Identifies Novel Potential Biomarkers of Habitual Food Intake in a Cross-Sectional Study of Postmenopausal Women. Wang Y, Gapstur SM, Carter BD, Hartman TJ, Stevens VL, Gaudet MM, McCullough ML. The Journal of nutrition. 2018; PubMed PMID: 29767735. Signaling and induction of chaperone-mediated autophagy by the endoplasmic reticulum under stress conditions. Li W, Yang Q, Mao Z. Autophagy. 2018; :1-3. PubMed PMID: 29771174.
α-Synuclein stimulation of monoamine oxidase-B and legumain protease mediates the pathology of Parkinson's disease. Kang SS, Ahn EH, Zhang Z, Liu X, Manfredsson FP, Sandoval IM, Dhakal S, Iuvone PM, Cao X, Ye K. The EMBO journal. 2018; PubMed PMID: 29769405. Use of Evidence-Based Interventions and Implementation Strategies to Increase Colorectal Cancer Screening in Federally Qualified Health Centers. Adams SA, Rohweder CL, Leeman J, Friedman DB, Gizlice Z, Vanderpool RC, Askelson N, Best A, Flocke SA, Glanz K, Ko LK, Kegler M. Journal of community health. 2018; PubMed PMID: 29770945. Response to Biologics Delay Progression of Crohn's Disease in Children but Not Early Surgery. Ballengee CR, Kugathasan S. Clinical gastroenterology and hepatology : the official clinical practice journal of the American Gastroenterological Association. 2018; PubMed PMID: 29775795. Phosphorylation alters Bim-mediated Mcl-1 stabilization and priming. Conage-Pough JE, Boise LH. The FEBS journal. 2018; PubMed PMID: 29775995. Teaching pediatric dermoscopy in a resource limited setting. Gurnee EA, Obeng RC, Stoff B. Journal of the American Academy of Dermatology. 2018; PubMed PMID: 29787845. Associations of Circulating 25-Hydroxyvitamin D3 Concentrations With Incident, Sporadic Colorectal Adenoma Risk According to Common Vitamin D Binding Protein Isoforms. Gibbs DC, Fedirko V, Um C, Gross MD, Thyagarajan B, Bostick RM. American journal of epidemiology. 2018; PubMed PMID: 29788105. 5-hydroxymethylcytosine alterations in the human postmortem brains of autism spectrum disorder. Cheng Y, Li Z, Manupipatpong S, Lin L, Li X, Xu T, Jiang YH, Shu Q, Wu H, Jin P. Human molecular genetics. 2018; PubMed PMID: 29790956. Minimally Invasive Lung Cancer Surgery Performed by Thoracic Surgeons as Effective as Thoracotomy. Boffa DJ, Kosinski AS, Furnary AP, Kim S, Onaitis MW, Tong BC, Cowper PA, Hoag JR, Jacobs JP, Wright CD, Putnam Jr JB, Fernandez FG. Journal of clinical oncology : official journal of the American Society of Clinical Oncology. 2018; :JCO2018778977. PubMed PMID: 29791289. The expression of lysophosphatidic acid receptor 5 is necessary for the regulation of intestinal Na /H exchanger 3 by lysophosphatidic acid in vivo. Jenkin KA, He P, Yun CC. American journal of physiology. Gastrointestinal and liver physiology. 2018; PubMed PMID: 29792531. Reply. Leung AK, Moses KA, Master VA. Urology. 2018; PubMed PMID: 29801928. Discovery of -Alkyl Piperazine Side Chain Based CXCR4 Antagonists with Improved Drug-like Properties. Tahirovic YA, Truax VM, Wilson RJ, Jecs E, Nguyen HH, Miller EJ, Kim MB, Kuo KM, Wang T, Sum CS, Cvijic ME, Schroeder GM, Wilson LJ, Liotta DC. ACS medicinal chemistry letters. 2018; 9(5):446-451. PubMed PMID: 29795757; PubMed Central PMCID: PMC5949813. Chaperone-mediated autophagy: Advances from bench to bedside. Li W, Nie T, Xu H, Yang J, Yang Q, Mao Z. Neurobiology of disease. 2018; PubMed PMID: 29800676. RNA-binding proteins with basic-acidic dipeptide (BAD) domains self-assemble and aggregate in Alzheimer's disease. Bishof I, Dammer EB, Duong DM, Kundinger S, Gearing M, Lah JJ, Levey AI, Seyfried NT. The Journal of biological chemistry. 2018; PubMed PMID: 29802200. Stereoselective Synthesis of Pyrans from Epoxyalkenes: Dual Catalysis with Palladium and Brønsted Acid. Setterholm NA, McDonald FE. The Journal of organic chemistry. 2018; PubMed PMID: 29771526. Assessment of Provider Adherence to Recommended Monitoring Parameters for Oral Anticancer Medications. Redelico TJ, Walton SM, LaFollette J, Adams M, Bernal-Mizrachi L. Journal of oncology practice. 2018; :JOP1700018. PubMed PMID: 29813011. Posterior Cerebellar Volume and Executive Function in Young Adults With Congenital Heart Disease. Semmel ES, Dotson VM, Burns TG, Mahle WT, King TZ. Journal of the International Neuropsychological Society : JINS. 2018; :1-10. PubMed PMID: 29843839. Spirituality and Quality of Life in Black Patients with Cancer Pain. Bai J, Brubaker A, Meghani SH, Bruner DW, Yeager KA. Journal of pain and symptom management. 2018; PubMed PMID: 29857179. Evolution of Pediatric Inflammatory Bowel Disease Unclassified (IBD-U): Incorporated With Serological and Gene Expression Profiles. Chandradevan R, Hofmekler T, Mondal K, Harun N, Venkateswaran S, Somineni HK, Ballengee CR, Kim MO, Griffiths A, Noe JD, Crandall WV, Snapper S, Rabizadeh S, Rosh JR, Walters TD, Bertha M, Dubinsky MC, Denson LA, Sauer CG, Markowitz JF, LeLeiko NS, Hyams JS, Kugathasan S. Inflammatory bowel diseases. 2018; PubMed PMID: 29860529. Attrition in NRG Oncology's Radiation-Based Clinical Trials. Ulrich CM, Deshmukh S, Pugh SL, Hanlon A, Grady C, Watkins Bruner D, Curran Jr W. International journal of radiation oncology, biology, physics. 2018; PubMed PMID: 29908786. Colon and Rectal Neuroendocrine Tumors: Are They Really One Disease? A Single-Institution Experience over 15 Years. Broecker JS, Ethun CG, Postlewait LM, Le N, McInnis M, Russell MC, Sullivan P, Kooby DA, Staley CA, Maithel SK, Cardona K. The American surgeon. 2018; 84(5):717-726. PubMed PMID: 29966574. Selenium Supplementation Alters Hepatic Energy and Fatty Acid Metabolism in Mice. Hu X, Chandler JD, Orr ML, Hao L, Liu K, Uppal K, Go YM, Jones DP. The Journal of nutrition. 2018; 148(5):675-684. PubMed PMID: 29982657.